Do you need custom made shade sails or custom shade cloth in Sydney? Contact our professional and friendly team at Sydney Shade Sails today! If you’re looking for custom made shade sails, look no further than our friendly and professional Designers at Sydney Shade Sails. 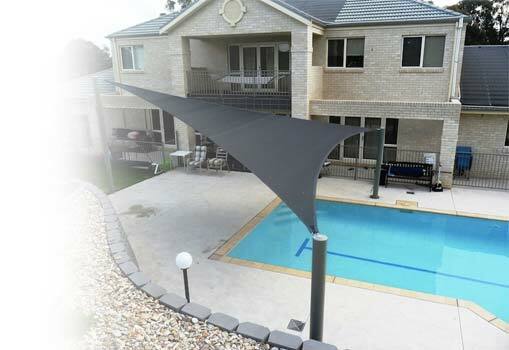 We specialise in designing, installing and maintaining custom made shade sails in Sydney. We are design consultants who take care in designing a shade sail to suit your needs. We visit, onsite working with you to create the ultimate shade to suit your outdoor space. We taking into account the desired effect you would like to achieve, we work with you in making the design work with your property and taking into account many variables to create your unique design. We use durable custom shade cloth in the construction of each of our shade sails. This ensures you get a beautiful and functional result. This collaborative approach means that you end up with exactly what you want, a stylish addition to your home. Not only do we create shade that is practical, we take into account all kinds of factors. These include: the type of shade you need, the time of day the area is most in use, angle of the sun, slope of the land, wind speed and weather conditions you want to use your shade in. We don’t just build shade sails, we enhance your outdoor area with a complete solution. Our industry knowledge, combined with our desire for excellent customer service, ensures you will have a pleasant experience from the initial consultation to the final install process. The dedication we have to our clients is a large motivating factor and also a reason we are quickly gaining popularity all over the Sydney area. We have built a reputation for excellence. This reputation is catching the attention of more people in the community. Focusing on quality and durability, our shades are built with the best quality materials available for your job. We use Architectural Grade materials and focus on achieving a high quality finish to our work. We design a variety of shade structures including Shade Cloth, PVC, Span Shades, and Shadex Arched canopies, to meet the needs and expectations of our customers. Our staff pride themselves on their ability to communicate with you from design through to installation of your shades.